It was the dumbest thing ever to a 5th grader. Now I wonder about this lady who grew up in a time when one out of every four Americans farmed, and many farmers were subsistence farmers who profited only from what was left over. The only time you ate corn was when it was harvested, shucked, cooked and put on your plate in the same day. These days it’s not really so much an abundant field of veggies and animals that feeds us, as an abundant field of oil. In a way, we are eating petrol. Mostly metaphorically. Somewhat literally. In other words, Americans are industrial eaters. Pollan’s first big reveal in his book is that nature is designed to draw it’s energy from the sun, but we now eat from nonrenewable, dirty fossil fuels. Oh sure, our corn still gets energy from the sun as plants always do. But the sunlight is the only thing left that we haven’t tampered with in the growing of corn. Even the fertilizer—which used to be poop—is messed with. Pollan gives us the fully story of the maize plant (which we call “corn“), a plant that ironically Western expansionists “stole” from South America, only to have it eventually enslave us, in a way, into poor health, bad eating, and the curse of imperialism. Not by being corn, but by having its nature exploited. By America. If anything, high fructose corn syrup should be called “Montezuma’s Revenge”, not diarrhea. The corn we used to know is not the corn we know today. The corn we know today, says Pollan, has developed “an appetite for fossil fuel (in the form of petrochemical fertilizer) and a tolerance for various synthetic chemicals.” In the ancient times, Middle American Indians would worship corn because it was a crop that was essential to their diet. Even though it is corn that relies on us to grow. Now we inadvertently worship corn today, by relying upon it more even than the American Indians, by monumentalizing it, and by sacrificing ourselves to it. It started out when corn farming was first industrialized. When the tractor replaced the horse, a lot of farmers decided to use the land they had for the horses to grow more corn. More farmers capitalized on corn because at first you could mechanize crops, but not a animal slaughter. This lowered the price of corn and, combined with new, expensive fertilizers that replaced poop and promised the same results, farmers had to raise even more corn, which didn’t help, because if it’s the corn raising that’s costing you, growing more corn will only cost you more. In Iowa, a once diverse rural landscape eventually turned completely yellow with corn (at least for part of the year). As we found new things to do with this cheap vegetable (cheap to buy, not to grow) we decided to use those ways in order to sell more corn to make up for expenses, including feeding corn to livestock. The livestock was/were shoved in factory pins to make room for the corn once we found out how to mechanize the livestock industry. Just as a corn-saturated landscape made Iowa’s economy unhealthy, so does our corn-saturated diet make us obese and malnourished. It used to be most everyone bought their corn from the guy who grew it or from a co-op. Now, most of the corn we get (whether at grocery store or from supplier to feed livestock) comes from a giant tower where farmers just pile their corn together. In the old times that corn you bought was linked to the man who grew it, and the reputation of that corn with the man who grew it. Now, you get it from a grocery corporation that got it from a corn corporation who can’t trace those kernels back to the various farmers who piled it up. It used to be farmers could talk about the different qualities of their particular corn: “Mine’s got big ears.” “Mine’s got plumper kernels.” Now all the corn looks the same, and all there is to brag about is how much you put out, even though you can’t brag about the money you made (or lost) doing it. Your tax money is paying for things to be this way, but the corn is, after all, cheap, cheap, cheap. If America ever became communist, our corn industry wouldn’t have to change very much at all. We already have a national supply, government-sponsoring, centralized production, and lots and lots of bad quality product. Pollan says that two companies, Cargill and ADM, “provide pesticide and fertilizer to the farmers; operate most of America’s grain elevators; broker and ship most of the exports; perform the wet and dry milling; feed the livestock and then slaughter the corn-fattened animals; distill the ethanol; and manufacture the HFCS and numberless other [chemicals]. Oh, yes—and help write many of the rules that govern this whole game, for Cargill and ADM exert considerable influence over U.S. agricultureal policies.” It is these companies, not farmers, who get the benefits of “farmer” subsidies. 1.Corn has been bred to not reproduce, patented by rich industrialists so that you have to buy seed from them if you want to grow corn. The very idea that you can patent a gene, let alone patent a plant, is an absurdity. Nature should not be treated like the intellectual property of the people who didn’t create it. Farmers are pushed into buying the new seed provided by GMO corporations, because these new seeds promise to yield more corn. But the seed itself costs extra, and doesn’t make up for the low price of the corn the farmers reap. The only ones making the money from the new seed are the GMO corporations. One independent farmer likens the practice of most corn farming to laundering money. The Bible likens practices of this nature to prostitution. 2. Corn is fed to animals whose stomachs were never made for corn. God made cows to eat grass, yet most grocery store beef comes from cows who have eaten corn. Salmon eat krill in the wild, but farmed salmon eat corn. So what? They eat it, and it makes the food cheaper. It also swells the bellies of cows to the point that they can hardly breathe, and causes as many intestinal issues as would a human on a diet of grass. But thanks to early slaughter, they don’t live long enough to die from a corn-saturated diet (well, most don’t, just not enough to cost the company money). 3. Corn is put in everything, mostly in the form of High Fructose Corn Syrup (HFCS). In a chicken nugget alone you will find modified corn starch to hold the “chicken” together, corn flour in the batter, corn oil to fry it, levinings, lycethin, and glycerides, corn in the coloring, corn in the “citric” acid. Over 1/4 of your grocery store items contain corn. Imagine how hard that is for people with corn allergies. And to top it all off, corn is in all kinds of non-foods too, like batteries. 4. Corn farming on an industrial scale is unsustainable and risky to our agricultural portfolio. In other words, cramming the entire state of Iowa with cheap, modified corn is killing the land, and if something ever happens to the corn, we’re screwed. See, a strong farm model is of one that operates with a number of rotating crops and livestock, keeping the soil healthy and cycling through nutrients. Also, if something happens to one of these crops or animals, the entire farm doesn’t collapse. When you gaze over Iowa, what you see is a field of yellow, like a big warning sign that the light will soon turn red. Bad simile; bad omen. Planting “corn on corn” instead of rotating crops not only drains the soil of nutrients, but also encourages plagues and insects. And if you only have one crop, then your only investment plummets. Also, “it takes more than a calorie of fossil fuel energy to produce a calorie of food,” Pollan observes, meaning that the industry is an unsustainable use of energy. 5. Corn corporations are getting subsidies and policy passes from the government. It’s not the small corn farmers who get the money. No, it’s the corn farmers who produce “big corn” who receive our tax money because they are “feeding our nation”, which has been happening ever since Nixon. Meanwhile many corn farmers lose money growing corn because corn is so cheap to sell and expensive to grow. Also, govt. agencies like the FDA and the Dept. of Ag are perpetuating laws and policies that not only favor large factory farms, but also maintaining a hypocritical low standard for food. 6. Corn is now fed Nazi fertilizer, and we are exporting war into our food. I just wanted to keep your attention. But I bring up the Nazi thing for a reason. As Indian farmer activist Vandana Shiva says, “We’re still eating the leftovers of WWII.” In one way we do this is that we rely on ammonium nitrate as an artificual fertilizer, which was originally leftover from WWII explosives (that’s why you can use fertilizer to make bombs). Pesticides also came about from poison gas experiments in WWII. Another way we’ve exported war into our corn is by using a formula by a German WWII-era chemist named Fritz Haber. It used to be that cycling corn with legumes and letting livestock ruminate on the grass kept nitrogen in the soil. But this chemist decided that he could do better than nature by using a nitrogen-rich synthetic fertilizer, eliminating the “need” for crop rotation and grazing livestock. This disrupted the food chain of corn farming. We stopped relying no the sun and instead relied on fossil fuels, much of which comes from countries we occupy, another way in which we export war into our food industry. It takes about 50 gallons of oil to maintain an acre of corn these days. Want the price of gas to go down? Change the corn farming industry. Does putting 8% ethanol in gas really make gas cheaper if we’re using so much petrol to make the corn we use to make ethanol? Monsanto was involved in the creation of the atomic bomb and Agent Orange, two devastating weapons that never should have been invented or used by anyone. So, when they signed up to tamper with food, on their resume they could have put that they have experience vaporizing consumers, demolishing grocery stores, irradiating the countryside, and wilting forests, farms, and metastasizing the lungs of US war veterans with one of the strongest herbicides known to man. 7. Corn farming on an industrial scale hurts local communities. I won’t even go into how the corn industry’s contribution to Wal-Mart’s grocery sections have hurt local economies (but luckily provided those communities cheap produce, right?). The corn crowding alone has devastated several towns in Iowa, some of whom have become virtual ghost towns. If there’s nothing but corn as far as the eye can see in your district, what else is there to do? Hope you get selected for the Hunger Games? The Bible says nothing about corn, because corn wasn’t discovered by the East. And these problems with corn have nothing to do with this God-given plant so much as what we’ve done with it. So what does the Bible have to say about the grain and agriculture? We’ll look at more as we go along, but here are some perspectives from passages dealing with industrializing a grain. 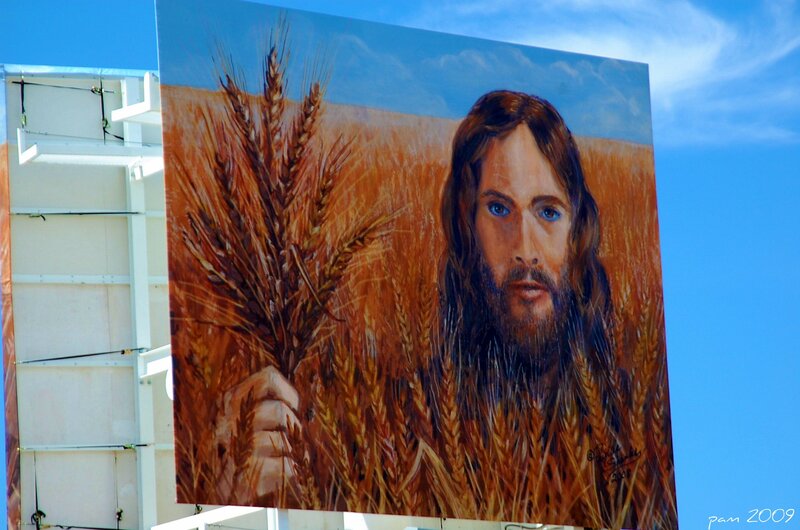 Walk with Jesus and glean some wisdom from the wheat field. Pollan mentions that “the Bible’s recommended farm policy was to establish a grain reserve“, but doesn’t go much into it. This was smart because if you produce too much of something and flood the market with it you create inflation, which lowers prices, and when the lean years come producers can’t make money and there’s not enough to go around, which creates a volatile place. Unlike Capitalism, which demands constant growth, Biblical economics advises that you prepare for lean years and not try to prolong the good ones. If you have any excess, you store up only for use in emergencies, not sell it all to other nations to increase your wealth. In fact, Pharaoh’s lean years might have been more difficult because of the over-production and over-consumption of his fat years. Egypt had no Sabbath day, and no Sabbath year. Notice how the grain reserve stabilized the economy once it was used. When times are good, it’s useless, and so it seems illogical compared to utilizing it to make other products cheaper. Granted, Joseph’s advice was for an empire like Pharaoh’s that was already centralized, and benefitted his holdings (they sold the grain to the people), but Joseph’s advice curbed Pharaoh’s practices toward more humanitarian means. We should be careful to apply his advice too directly to all situations. If Joseph’s prediction of the lean years was directly from God and not by means of agricultural wisdom alone, then we also cannot fully predict what may happen to our crops and create foolproof plans. My question for any of you is this: What relevance is Joseph’s advice to our economy? What relevance is it to small farmers? Keep in mind that Joseph is serving as an adviser to a very worldly emperor, and not as a member of a counsel in Israel or Judah. Would his advice or order be different in those circumstances? Amos and Micah had angry words for those who couldn’t wait for the Sabbath to end so they could produce and sell more and more wheat, those who didn’t care to give the land a rest or honor the God who gave it to them. Jesus illustrated the fool who said, “I will build bigger storehouses of grain for myself to and have more surplus.” This criticism is meant for those who build more storage for the purpose of more selling and gaining, not preparation for down times. The Gospel does not endorse expanding businesses just for the sake of extra profit at the cost of more important things. The Sabbath, a day of rest, was made for man. Not only were people supposed to rest, but so were animals. The land was also given a rest, because it was not plowed. In fact, every seven years was a Sabbath year in which no agricultural activity was to take place (although some say maintenance activities like watering and weeding didn’t count). Only fruit growing freely could be taken, and anyone could take of any of it. Sadly, this practice was very neglected in Israel’s history. Aside from the ceremonial implications, there were very practical implications of such a practice, unless of course you wanted to make a lot of money. Greed was one of the chief reasons people violated the Sabbath. Although the specific practice is not binding on Christians, the concept of resting in the name of God carries on, from worshipping on the first day of the week to the continuing wisdom against overworking and over-toiling for gain. How does this constant, never-ending heavy duty factory farming of crops (and livestock, as we shall see) exemplify such wisdom in any way? As Wendell Berry says, in an industrial economy, the land can never rest, for then you’d get caught behind your competition—you wouldn’t gain as much profit as your competition. “God chose the weak things of the world to shame the strong,” writes Paul (1 Cor. 1:27). There are many ways we see this happen, like when David faced Goliath. But with David there was a victory as well as a shame. Sometimes, when there is yet a victory to be had, there is still a shame. America’s great grain surplus is shameful, and not a source of pride. In history those nations with the surplus of grain have lorded power over weaker nations. Strong kings like Ahab tried to muscle their way into ownership of farms like Naboth’s. In our case, the military-industrial complex is reliant on our grain surplus. If you’re wondering why there is still so much hunger, one reason is that our surplus does not exist primarily to feed people, but to keep a machine going that keeps the rich rich and the powerful powerful. Consider this chastisement from the prophet Amos. What would he say to America today concerning the agricultural practices of her leaders? God has always been disgusted by “dishonest measures“, by cheating people out of the worth of a product. Just like a man who mixes chaff with grain to sell for its weight in grain (or mixes sand with salt), we mix fake fertilizer with real fertilizer, good corn with bad. Merchants in Amos’s time would sell grain using small weights, but buy grain with heavier weights. The farmers lost money as the merchants gained money. When a farmer is losing money because he is doing exactly as he is forced to do by law mixed with what he is pressured to do by the companies who buy his grain, there is some “dishonest scale” work going on. Amos and Hosea lived and prophesied in a time when archeology suggests that a centralized commodity agriculture system (the ancient, non-mechanical version of what we have today) was put in place by Israel and Judah’s kings. It’s no wonder that so much of their prophecy is not only agrarian-centered, but concerned with economic justice. Amos talks of agricultural taxations (5:11; 7:1) that placed a burden on farmers. Put this together with the “ploughshares into swords” attitude that turned laborers into soldiers and may have literally used farm tools to create weapons, and you have a recipe for economic disaster. This practice of taxing peasants to the limits of what they could pay was something Israel borrowed from her neighbors. Farmers went into debt. and had to sell their land to the king’s men, who centralized the grain. This is one reason the Jubilee was so necessary, to hit the reset button on what would eventually cycle into an unsustainable economy. Thanks be to God that these farmers could get back their family farms and have their debts remitted. That is, when Israel actually respected and carry out Jubilee. Jubilee kept Israel in a faithful understanding of the land, that the land has a value beyond monetary value. When they practiced it, of course. I challenge you to find me any record, in the Bible or otherwise, of an Israelite willingly putting his land up for sale on the market. Land was not a commodity to them. As long as Jubilee was faithfully kept by everybody, there would never be a permanently landless class. Every family would always have land or the promise of having their land redeemed. Imagine if such a promise could be given to the farmers who once had land on what is now endless fields of Iowa corn owned by corporations. Is Pollan’s picture of the corn industry unrealistic or unfair? For example, what about all the people we are feeding with all this cheap, excess corn we have? And isn’t this good for the poor if the cheap corn makes for cheap meat? If I’m wrong about any of these things, what Biblical parallels exist that point us in another direction? What other Bible passages come to mind? Join us in part 2, wherein we discussed the the Feedlot, the Grocer, and the McD’s. This entry was posted in Books, Green Earth and Body and tagged ADM, agrarian, botany of desire, Cargill, corn, energy, foodies, green, HFCS, high fructose corn syrup, industrialization, inflation, iowa, jubilee, localism, locavore, maize, michael pollan, Monsanto, omnivore, omnivore's dilemma, organic, petroleum, pharaoh, poverty, sabbath, super size me, war. Bookmark the permalink. Why haven’t corn farmers caught up with the post-industrial (and in a way pre-industrial) farming world? The field is “addicted” to corn. It’s hard to make the conversion, and if you do you don’t get the govt. money, which is how some corn farmers manage to stay in biznass. A lot of farmers are jumping out, too, because they realize they’re slowly losing money. It’s not the production of corn itself, but the production of cheap corn. You can find some independent corn farmers who make a good return on their investment for selling non-GMO corn to local families and restaurants. Their corn turns more profit for those willing to pay more, and they spent less money on fertilizer and petrol. They just don’t get the govt. money because they’re the little guy. And that’s another reason they keep growing the corn. Corn is a welfare queen. Why take the risk of working hard to sell good corn on good soil to people for a higher price than what they buy at the store, when the government is giving you a cash bonus for a bulk transaction you know will take place every year no matter what? Even if they’re slowly losing money, at least they’re making some. And their customers would have to be convinced enough to forsake Wal-Mart corn products and buy his bushels. Big risk in a lot of places. Plus, Dorothy’s scarecrow isn’t too far from the truth, in that over the years colleges have been drafting the smart kids off the farm and into industrial fields, so they get smarted on how to engineer things to be more “efficient”, but not how to practice sustainable farming, leaving the “dummies” in charge of the big corn farms, with no knowledge about how to do anything other than throw fertilizer, buy GMO seeds, and harvest. The irony is that most really smart people would speak well of farming, but would be ashamed to actually be farmers, especially after all that money they threw at their education. People who farm sustain-ably don’t do it for the money. The Bible doesn’t mention corn? Haven’t you read the King James Version? I was waiting for someone to bring that up. smiles.